Two new senior appointments at Leeds’s foremost centre for contemporary art and learning are set to lead The Tetley in its drive to be the North of England’s most significant venue for emerging artists. Taking the new role of creative director is Bryony Bond, formerly of the Whitworth in Manchester, as president of Leeds Chamber of Commerce, Gerald Jennings, takes on the role of chair of trustees. Under the strategic leadership of CEO Dirk Mischendahl, The Tetley is now an established venue on Leeds and Yorkshire’s visual arts scene. Since opening in November 2013 The Tetley has received over 232,000 visitors; created 48 artists projects including exhibitions, residencies and new commissions; held over 150 events including talks, tours, lectures and film screenings and over 170 creative workshops for local people of all ages and backgrounds. These new appointments set the seal on The Tetley’s growing reputation as a significant cultural resource for artists and audiences for the whole of the North of England and nationally. The Tetley’s first creative director, Bryony Bond is keen to build on the organisation’s emphasis on supporting artists, offering them new opportunities in an original and stimulating environment. Bryony brings to the role a wealth of experience, from curatorial positions that she has held at the Whitworth, National Museums Scotland, Camden Arts Centre and A Foundation in Liverpool. Her extensive knowledge of contemporary visual arts practice is complemented by local Leeds involvement on the Board of visual arts commissioning organisation Pavilion. In her new role, which she took up on 4 January, Bryony will have complete control of the creative direction of The Tetley. From working with artists, curating and programming exhibition spaces, the creative direction also will influence Bar & Kitchen, the events programme and communications, making The Tetley an entirely ‘artist-led’ experience. Bryony Bond said: “There’s so much already here for me to build on and I am really excited about continuing the excellent work started by the visionary co-founders Pippa Hale and Kerry Harker. The Tetley is in a great position to be the best showcase of creative contemporary talent which is incredibly strong right across the North of England. Best known for his current role as president of the Leeds Chamber of Commerce, following over 25 years’ property and retail experience, Gerald Jennings steps into the role of Chair, having been a Trustee of The Tetley since its inception. 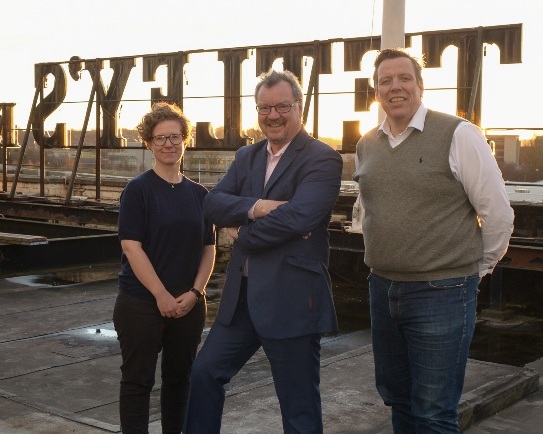 Gerald Jennings said: “It is a testament to phenomenal work of the founders and the team that we have attracted someone of Bryony’s calibre to The Tetley. Now that we have shown what is possible in Leeds, Bryony’s wealth of experience, extensive knowledge and enthusiasm for the role will help to take us to a new level.